A Bittersweet Fountain: Cosplay: Why Nova? There reaches a point in every year when a person has to make an important decision. Namely "What will I cosplay at next year's con?" For me, *that* con is DragonCon. Though there are other smaller, Albuquerque conventions I attend, DragonCon is the only one I dress up for. I've cosplayed for the past two DragonCons and of course I intend to cosplay for DragonCon 2013 as well. So it was approximately last March when I was trying to figure out what new cosplay I wanted to add to my collection. I still had my Loki cosplay, my steampunk cosplay, and my Ravenclaw cosplay, but I like to add something new each year. And this year I wanted to do something that I would fit my skill set so I could make most of it myself. At least, that was the hope, as per usual. I don't like to cosplay as just anything. I like to cosplay as things I like. I love the aesthetic of steampunk, I love Harry Potter (in case you couldn't tell by our three part podcast on this subject), and of course, I adore Loki. So what could I find this year that matched the same level of awesome as dressing up as my favorite supervillain? Well, this was the year I started reading comics, so I looked there for my inspiration. My first thought was Batgirl, ala new 52, and I did some early sketches and design work to that effect. But the more I thought about it, the more and more I was drawn to Nova. Who is Nova you ask? I was introduced to Nova via the Ultimate Spider-Man cartoon, which I watch regularly. (Don't judge me. Some of the greatest shows ever are cartoons, case and point Avatar: the Last Airbender). In the Ultimate Spider-Man cartoon, Spider-Man is sort of a superhero-in-training for SHIELD, and part of his training is that he leads a superhero team of other teenaged superheros. Most of the other superheros take Spider-Man's leadership pretty well, but Nova is constantly challenging Peter. He doesn't have quite the same level of snarky quip power as Peter, but in general he's a pretty good foil for Spidey. And the more I watched the show, the more I loved him. So of course when the Marvel Now Nova comic came out, I started reading it. I picked it up on the second issue, which is not something I can say often. Nova in the comic isn't quite the same level of jerkface that Nova in the cartoon is, but I still enjoyed the character. And I love how the comic spent more time in space, and how Nova was being trained by the Guardians of the Galaxy. I'm a sucker for space and I currently adore the Guardians of the Galaxy, so of course I ate the comic up. 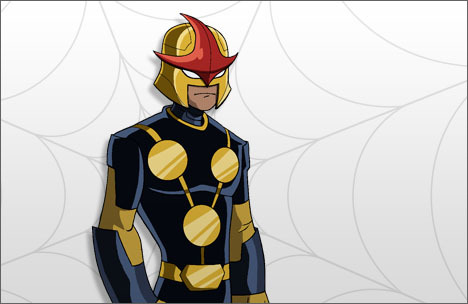 Longtime Nova fans know that Sam Alexander, the Nova of Marvel Now and the Ultimate Spider-Man cartoon, is not the original human Nova. That honor goes to Richard Rider, who is completely awesome by all accounts. A lot of people haven't quite taken to Sam because they miss Richard, and Sam's entire backstory seems to contradict Rider's. (I say seems because I'm pretty sure the creators are going to address the "Rider was the only human Nova" issue at some point.) But I knew nothing about Richard, only Sam. And many of the reasons why I love Sam are the reasons why I love MG and YA fiction, the reasons why I love Ultimate Spider-Man and the Young Avengers. Sam's story is a coming-of-age story. It's the story about a boy discovering himself and his place in the universe. That's a classic story, and a story that I've always been drawn to. I mean it's the story that's the basic template for most epic fantasy! And you guys know I adore epic fantasy. 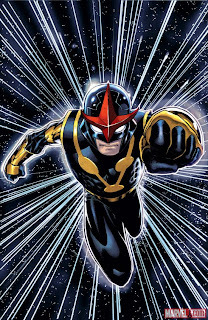 But one of the appeals of Nova, outside of Sam or Richard, is that Nova unlike Spider-Man is not a name given to any one person. 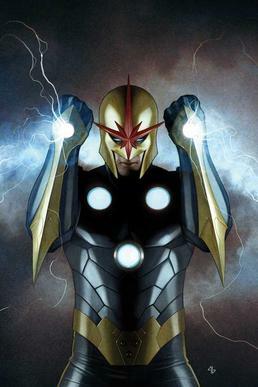 Every Nova is part of the Nova Corps. 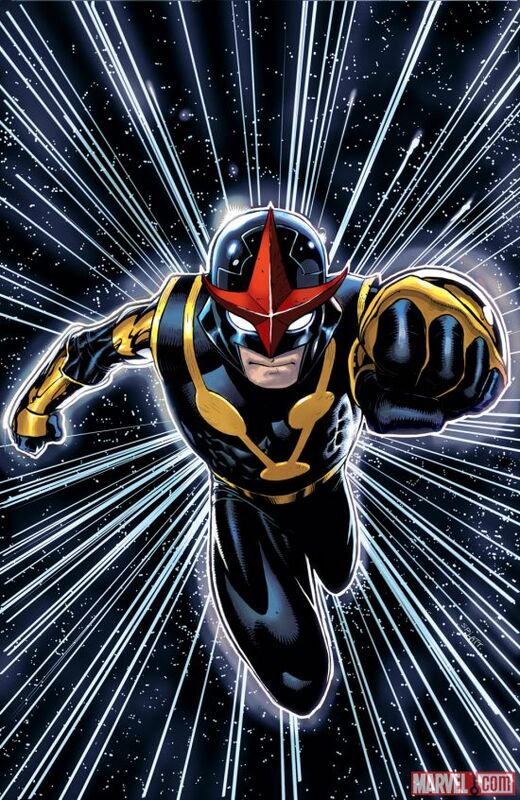 Basically, Nova is Marvel's answer to the Green Lantern. So I could be me and be a Nova. I can be a girl and be a Nova. I can be Mandy and be a Nova. And that's a very appealing idea. I don't have to be anyone else. I can be me and be a superhero. ton of Loki's. The Avengers had come out the previous May and Avengers cosplays were a dime a dozen. Nova would be unique and ahead of the curve, because it was revealed around the time I was working on this cosplay, that the Nova Corps would play a part in the new Guardians of the Galaxy movie. And then only last week the first glimpses of the Nova Corps were revealed. (Though I hope desperately that the guys in those pictures are only grunt level Nova and that there are more awesome costumes for the Nova corps). So for once I'll be ahead of trend, and I'm pretty excited by that prospect. One appeal of Nova was also the awesome helmet. I can't sew to save my life so when it comes to making costumes, there is a lot of searching the web and stores for different pieces to make the perfect conglomeration of awesomeness. But I'm an engineer and looking at the helmet I was like "yeah, I can make that." So why Nova? Because he's awesome, because I love him in the cartoon and the comics, and because he's got a sweet uniform. And because I can be me. Thursday I'll post about how I made the helmet. I chose to model my costume off of Sam Alexander in the comics, not in the TV show or Richard Rider, because I really like the pop of red on the black background. And then next week hopefully I'll post about how I put together the rest of the costume with the help of my friends. I'm really looking forward to showing off this cosplay at DragonCon this year. Nova is one of my favorite characters to cosplay, thoroughly enjoyed my time as him! Glad you had fun as well!